From Which I Came arrived without fanfare. Few blogs or newspapers trumpeted its release. 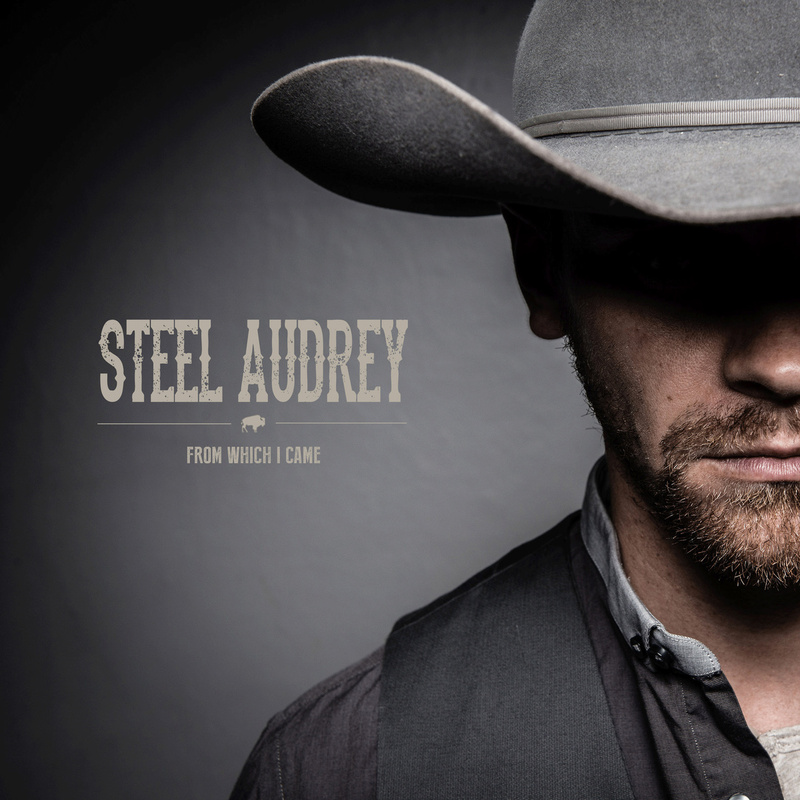 Despite the positive buzz generated by a self-titled EP in 2012, mentions of this latest collection from Canadian singer-songwriter Steel Audrey (Derek Kehler), are scarce. Instead, the full-length debut stealthily rolled in, like a midnight train carrying its unassuming passengers to their final stop. Perhaps that’s only fitting given the nature of the recording. There is nothing brassy about From Which I Came, a quietly eloquent country-folk album that touches on spirituality, mortality, and yearning, yet is devoid of blustery declarations. How did a prairie poet from southern Manitoba make one of my favorite albums of the year? Of course, simplicity is deceptive. It takes time and talent to make an album sound as effortless and cohesive as From Which I Came. The record is the end result of two years of creative labor and collaboration between Steel Audrey and acclaimed producer Matthew Rogers of Vancouver blues duo The Harpoonist And The Axe Murderer. Rogers complements the rugged texture of Steel Audrey’s voice with modest but classic production, crafting a recording that should leave even the most staunch country traditionalists salivating. Breathing new life into a vintage sound requires an excellent crew of supporting musicians. Industry veterans including Tom Heuckendorff (organ), Erik Nielsen (bass) Kathleen Nisbet (fiddle), John Raham (drums) and Scott Smith (pedal steel and electric guitar) join Rogers (acoustic and electric guitar, banjo, and organ) in laying the album’s groundwork, providing a foundation of understated instrumentation that captures the breadth of Steel Audrey’s musical influences. Jody Peck, Sarah Orton, Christie Rose, and Savannah Leigh Wellman lend their affecting voices to the cause, adding new dimensions to Steel Audrey’s songwriting. From beginning to end, From Which I Came is a captivating listen, kicking off with honky-tonk cautionary tale “Gold Digger” and closing with bluesy hymn “Meet My Maker.” Steel Audrey’s ruminations on life, love, and death are deeply felt, never pretentious. His lyrics smack listeners squarely in the chest, penetrating even the most guarded hearts. Even smaller and sillier moments offer room for reflection. The dark humor of “Manitoba Jackfrost Blues” is offset by the tune’s infectious boogie, which is driven by spectacular electric guitar work. When a man is locked out of his home and forced to spend Christmas Eve with his farm animals, he quips that “If Jackfrost is the devil, then Manitoba must be hell.” You can’t help but notice that the narrator is seemingly without any friends or relations to check up on him, offering a more complex portrait of the depths of his isolation. While there isn’t a weak composition in the bunch, one of the most striking is the poignant waltz “Back To The Earth (From Which I Came).” The narrator’s simple request of his loved ones in the event of his death is unexpectedly moving. Layers of evocative pedal steel make the song a cathartic tearjerker. Ultimately, From Which I Came isn’t a great album due to its traditional sound. It is great because it embodies the best of country music, demonstrating how the honesty of the genre’s songwriters appeals to the most basic human emotions. While this album may have arrived largely unheralded, it deserves to have its praises sung far and wide. Writer’s note (June 9, 2015): Today there was absolutely heartbreaking news: Derek Kehler and his girlfriend Helena Curic passed away of carbon monoxide poisoning. Everyone, please pray for their loved ones.